St. Aloysius Academy purposefully incorporates Science, Technology, Religion, Engineering, Art and Math – STREAM - into problem based learning. The time of isolated instruction and learning is over, as educators strive to meet the deeper learning needs that are essential for a child to succeed in high school, college, career, and in life. Faced with this challenge, St. Aloysius Academy is utilizing an initiative to more purposefully incorporate Science, Technology, Religion, Engineering, Art and Math – STREAM – into problem based learning. Problem based learning is examining real world issues with a cross curricular mindset. Not only does this methodology reinforce basic skills in each subject area, STREAM learning also creates more opportunities to build and deepen aptitudes like collaboration, creativity, critical thinking, and problem solving. As adults, we know that such skills are of tremendous value, not just within the walls of academia, but in the greater context of life. We know that even the most academically gifted will not be successful if he or she cannot also work cooperatively with peers, present ideas clearly, and think beyond the traditional constructs. As if guiding students to be 21st century learners isn’t enough, SAA reaches for an even higher goal: to inspire our students to use all of their gifts, not for themselves, but to be “men for others.” Whenever we consider a project based STREAM topic, we also delve into how the topic can include an expression of our Catholic faith. During the summer, our middle school students read The Owner’s Manual for Driving Your Adolescent Brain by Joann Deak and Terrence Deak. The book addressed the monumental changes that occur in the brain during the period of adolescence, as well as what young people can do to manage these changes and keep themselves well during this time. Part of the book addressed ways to keep their brains safe. In conjunction with the boys’ reading of this book, the middle school science classes kicked of the year by completing an Egg Drop STREAM Challenge. We used eggs as models for our brains, and discussed the various reasons why models are often valuable to scientists. The students followed the engineering design process to build, test, and refine prototypes of devices that could protect an egg in a fall from the second floor balcony outside of the classroom building. Finally, we discussed how our faith teaches us that our bodies are gifts from God and we are called to protect them. This challenge was a fun and educational start to the year in our middle school science classes. This was just one of a various STREAM activities held this year. Students from kindergarten through eighth grade participate in similar programing all year long. It is in this way that we are meeting the needs of the 21st Century learner and guiding each student to the greatness God intends for them. 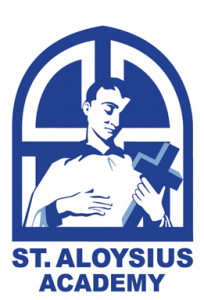 Does St. Aloysius Academy feel like it would be a good fit for your child? Maybe you have questions for SAA Parents? We’ve been connecting Main Line parents since 2010. We encourage you to join the conversation in the comments. Click here to register and make an appointment for a personal tour. Photographs provided by St. Aloysius Academy. A dynamic and challenging learning environment for boys since 1895, St. Aloysius Academy provides a faith-based, caring atmosphere where K-8 students can grow to be their personal best.